The 13th National Assembly elected Nguyen Thi Kim Ngan as Chairwoman of the National Assembly, Tran Dai Quang as President, and Nguyen Xuan Phuc as Prime Minister during its final session which took place in Hanoi from March 20 to April 12. Other key leading positions of the state apparatus also have new holders, including Dang Thi Ngoc Thinh as Vice President, Nguyen Hoa Binh as Chief Justice of the Supreme People’s Court, Le Minh Tri as Procurator General of the Supreme People’s Procuracy, and Ho Duc Phoc as State Auditor General. The cabinet has 21 new members, including three Deputy Prime Ministers and 18 ministers and other members. The new three Deputy Prime Ministers include Truong Hoa Binh, former Chief Justice of the Supreme People’s Court, Vuong Dinh Hue, former Head of the Party Central Committee’s Economic Commission, and Trinh Dinh Dung, former Minister of Construction. At this session, heads of the National Assembly’s agencies were also elected, including Ha Ngoc Chien as Chairman of the Ethnic Council, Vo Trong Viet as Head of the National Defense and Security Committee, Nguyen Duc Hai as Head of the Finance-Budget Committee, Le Thi Nga as Head of the Law Committee, Nguyen Thuy Anh as Head of the Committee for Social Affairs, and Nguyen Thanh Hai as Head of the Committee on Culture, Education, Youth, Adolescents and Children. Regarding lawmaking work, the National Assembly passed seven laws, aiming to further complete the legal system in line with the 2013 Constitution. They include the Law on Access to Information; the revised Law on Conclusion of, Accession to, and Implementation of Treaties; the revised Press Law; the revised Law on Child Protection, Care and Education; the revised Pharmacy Law; the Law Revising a Number of Articles of the Law on Value Added Tax, Law on Excise Tax and Law on Tax Administration; and the revised Law on Import Duty and Export Duty. In her closing speech, newly elected National Assembly Chairwoman Nguyen Thi Kim Ngan said a key task of the last session was to review the National Assembly’s performance throughout the tenure. Lawmakers devoted time to examining reports reviewing the five-year performance of the National Assembly, President, Government, Prime Minister, Chief Justice of the Supreme People’s Court, Procurator General of the Supreme People’s Procuracy, and State Auditor General. She confirmed that in the context of changing domestic and international situations, under the leadership of the Party and with the trust, support and supervision of the people, the state apparatus has inherited and promoted achievements of the previous tenures, while continuing with reform of its organization and operation, thus fulfilling its duties assigned by the Constitution and laws. The National Assembly and its agencies enhanced their activities in making the Constitution and laws, conducting supreme oversight, and making decisions on national key issues. The President demonstrated his role in both domestic and external affairs as well as in commanding people’s armed forces, thus contributing to consolidating the great national unity and maintaining a peaceful and stable environment for development. The Government and the Prime Minister exerted a lot of efforts in socio-economic management, giving strong, firm and creative guidance to bring about positive changes amidst difficulties and disadvantages. The National Assembly treasures the great contributions made by the former leaders to the country’s socio-economic development cause and the Legislature’s operations, Ngan stressed. For the first time, the heads of the Legislature, State, Government and Supreme People’s Court made oaths in front of the national flag, pledging to be absolutely loyal to the Fatherland, the people and the Constitution and vowing to do their utmost to fulfill their assigned tasks, she said. The National Assembly shows trust in and support for the newly elected leaders and wants them to further foster their moral qualities and professional qualifications so as to accomplish their duties, she asserted. On the last working day of the session, the National Assembly adopted the Resolution on the 2016-20 five-year socio-economic development plan, which sets the overall targets ensuring macroeconomic stability, striving for a higher economic growth rate, accelerating the implementation of strategic breakthroughs, restructuring the economy in parallel with renewing the growth model, and increasing productivity, efficiency and competitiveness. Promoting culture, democracy, social progress and equality as well as guaranteeing and increasing social welfare and local living standards are also the goals of the plan. Other main objectives include proactive adaptation to climate change and effective management of natural resources and environmental protection; strengthening national defense and security, persistently and resolutely safeguarding national independence, sovereignty and territorial integrity; and ensuring political security and social order and safety. The plan also aims to improve the efficiency of external affairs and international integration, while sustaining peace, stability and creating a favorable environment for national construction and defense, thus elevating the position of Vietnam in the international arena and developing the country into a modern industrial one. The National Assembly also approved the Resolution on reviewing the performance of the National Assembly, President, Government, Prime Minister, Chief Justice of Supreme People’s Court, Prosecutor General of Supreme People’s Procuracy, and State Auditor General in the 2011-16 tenure. The resolution made clear that the National Assembly basically approved the assessment made by the aforementioned organs and officials on their performance as well as on their shortcomings, limitations, and lessons learnt. 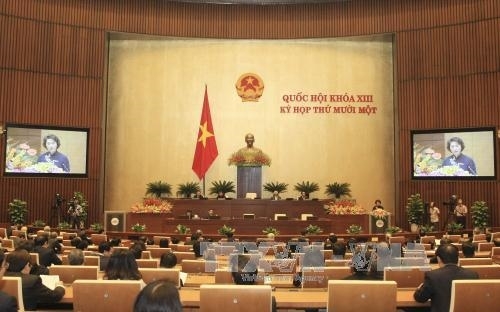 The resolution stressed that in the time ahead, the National Assembly should further improve the quality and efficiency of its activities in order to promote democracy, creativity and transparency, thus ensuring its fulfillment of the role as the supreme representative agency of the people and the supreme power body of the Socialist Republic of Vietnam. Meanwhile, the President should uphold his role to contribute to strengthening the national unity, firmly safeguarding independence, national sovereignty and territorial integrity, and enhancing efficiency of external relations. The Government and the Prime Minister need to focus on leadership, management and direction, building a pure, strong, united and responsible government of action, and finding effective measures to realize annual and five-year socio-economic targets. The National Assembly also resolves that the Government must continue restructuring and enhancing management of the state budget and public assets, taking appropriate measures to increase budget revenues, reduce overspending, and curb public debts and bad debts, while paying due attention to improving the people’s material and spiritual lives, ensuring social welfare and speeding up poverty reduction. Meanwhile, the Supreme People’s Court and Supreme People’s Procuracy are asked to implement their responsibility and power in accordance with the Constitution and laws, improve the quality of judicial activities, and ensure human rights and citizens’ rights. 4. Do Van Chien, Minister-Chairman of the Committee for Ethnic Affairs.